Call for a Free Estimate: (904) 379-5843Show Me Tree Service is considered one of the best tree cutting companies in Jacksonville. Jacksonville has many trees that range from pines, oaks, elms, cedars, ash, pecans, cottonwoods, hack berry, hickory, walnut, and much more. This service can be dangerous at times, so make sure to use a professional tree removal service to ensure the job gets done safely and cost-friendly. There is nothing like a home that features prettily groomed trees in the yard; however as lovely as they may be, there comes a time when they have to be removed in order to secure the safety of your house or business property. The certified professionals at Show Me Tree Services have knowledge of the correct guidelines and procedures, as well as the right equipment that should be used in these endeavors. We have been caring for trees in the Jacksonville area; including Orange Park, for more than fifteen years, and we happily service the interests of homeowners, businesses, and municipalities. We specialize in all areas of tree removal – from dangerous, to large, to hard to reach, as well as dead trees. We even handle disease infested jobs. 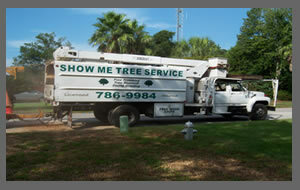 Show Me Tree Service has over 20 years experience and can help you with any tree situation you may have. Below you can find how our services can help and reasons you may need a tree removed. Tree Removal – Why should a tree be removed? Well, there are many reasons for removing a tree from your property or lot. Trees that are dead or dying may need to be cut before damage is done to a human being or property. If your tree is leaning over your home, high winds may bring the tree down on your house. Some trees might be tearing up your foundation to your home, driveway, sidewalk, or a man-made structure many need to be cut down. New construction may be going up and your tree could be in the way. Or, if your lawn or garden doesn’t have enough sunlight reaching it, this service might be the only choice for new growth. Show Me Tree Service and our low prices will save you money and time with professional tree cutting. If your tree doesn’t need to be removed, consider our Tree Trimming Services. Dead Tree Removal – Trees that are dead are more of a liability, and are much more dangerous to cut down. Dead trees will cost more sometimes, particularly if the removal process is high risk. These trees will break easier, and when falling will choose its own direction. Thus, this process is more risky due to the rotten wood core. Remove your trees before they die off, and escape the higher cost of high-liability tree cutting. Pine Tree Removal – Pine trees typically grow higher then oaks and hardwoods. When removing a pine tree, you must first know how they grow inside. Pines are heavily wooded, and tend to break more easily then oaks. The limbs will snap if frozen or dried out from the heat, which can make the removal process dangerous. Show Me Tree Service can help you with your pine removal services with low prices. We will send out a qualified sales tech to survey your pines, and help you decide what pines need to be cut or trimmed back so damage is prevented. Oak Tree Removals – How are oak trees different from pine trees? First off, oaks are “hardwood trees” and do not tend to break as easy as pines. Oak tree roots run deep and cover large surface areas above and below the ground. Jacksonville has many different types of oak trees ranging from red oaks, willow oaks, white oaks, black oaks, pin oaks, post oaks, water oaks, live oaks and much more. Oak trees are great firewood trees, and are considered one the best woods for cooking. Large Tree Removal – Large trees may need to be lifted with a crane or bobcat. 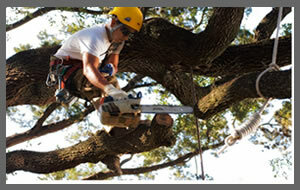 Show Me Tree service can help you with all hard to reach or large tree removal services. Elms, pines, hack berries, maples, sweet gum, cypress, sycamore, cottonwood trees grow the biggest in Duval or Clay County, Florida. 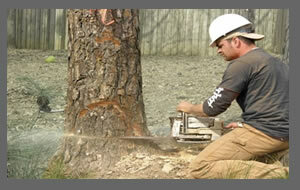 Dangerous Removals – These types of trees consist of dead, dying, large or complicated tree removals. 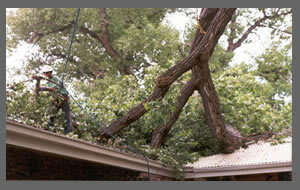 Trees over your home or structural property are considered highly dangerous and hold high liabilities. Show Me Tree Service takes extreme caution in dangerous tree jobs, using only the best tree cutting equipment and tree care personnel. Emergency Tree Removal – Hurricanes and strong storms can cause high winds that bring down trees and limbs, which can occur any time – day or night. If you have a tree on your home, house, sidewalk, driveway or on your structural property, you may need our emergency tree service. Especially when looking at other companies, urgent tree cutting can be a matter of costing you a great deal more out of pocket. Show Me Tree Removal service has a crew ready to help you on all your urgent, emergency, and unexpected tree situations. Multiple Tree Removal – Having one tree removed typically costs more on a per-tree basis than having multiple cut at once. The more trees you decide to have cut down, the more you will save on each. Senior Discount – If you are at or over the age of 63, then you qualify for our senior discount coupon. 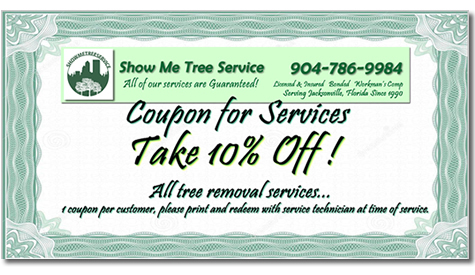 This will allow you an additional 10% off any tree removal or tree trimming services. Tree Trimming Service – We trim trees to help promote grass growth, or to simply beautify your trees. Limbs that are over your home, driveway, sidewalk or porch may need to be trimmed back. We take great pride in our tree trimming services, and will gladly assist in helping you decide what needs to be trimmed or removed. 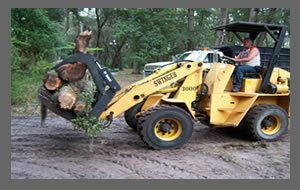 Bobcat Work – Using a bobcat to remove your tree will help the process move along more safely & efficiently. 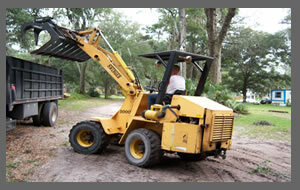 Bobcats can lift up to 1800 pounds, and will save money by speeding up our work on your property. As an added bonus, this machine greatly helps reduce garden or plant damage. Crane service is need only on dead, dying, large or complex tree removals. Why engage a professional tree removal service? While we don’t want to take out trees, there may be times when it still unavoidable. Hazardous trees can show defects that have weakened their integrity, which can make them a danger to their surroundings, becoming apt to falling on a building, vehicle, or even a person. Having trees that become damaged, makes it vital that they be removed in the proper manner in order to safeguard the people and property around the tree. The certified tree specialists at Show Me Tree Service are schooled in the use of the correct procedures and safety equipment necessary to safely and effectively remove trees that are a threat. Tree inspection is best done at least once a year by a professional, to make certain that your trees haven’t become hazardous. Call Show Me Tree Service today and let one of our tree experts come and evaluate their trees to make certain they are safe. We work with municipalities, homeowners and many businesses to make certain that the trees in the Jacksonville area are safe for everyone.